Take a peek at the Kindergarten Readiness Guidelines from the IDOE and make sure your child is prepared. Kindergarten Registration for the 2019-2020 School year will begin in April at the Early Learning Center. Please take a minute to review the enrollment requirements and the dates available. The Early Learning Center at George Earle is SCOH's highly acclaimed center for early childhood education. Here you will find programming for our littlest learners that will help prepare them for academic success. Catch up on what great things our students are doing this month! You are invited to Kindergarten and Coffee at the ELC! Come join the discussion and get tips for your child's academic success and developmental needs. Check out the app SCOH uses to track location of your bus! 6:00 PM 5th Grade 'Too Good for Drugs' Graduation! School City of Hobart is Building College and Career Ready Students One Brick at a Time! The School City of Hobart Community will foster intellectual curiosity, natural abilities, critical thinking, and literacy in students while developing respectful and responsible citizens who are excited about the challenges of tomorrow, confident in their ability to chart the future, and dedicated to the pursuit of lifelong learning. AdvancEd's North Central Association Commission on Accreditation and School Improvement? The Indiana Department of Education has identified a great need for more rigorous and engaging STEM Education. STEM certified schools serve as models for Indiana and their commitment to teaching the STEM disciplines of science, technology, engineering, and math - untimately preparing studetns for success in the 21st century! In Indiana, there are only 60 schools who have received the distinction of being recognized as entirely STEM certitied through the Department of Education. The School City of Hobart is proud to have ALL 6 of our schools STEM certified which means that 1/10 of all schools certified in the state of Indiana are in the School City of Hobart! Schools are chosen to receive certification based on their commitment to teaching the STEM disciplines of science, technology, engineering, and math throughout the entire school. STEM Certified Schools exemplify a highly non-traditional approach to education, employing a great deal of inquiry, project-based learning, community engagement, entrepreneurship, student-centered classrooms, integration into humanities and related arts, and out of school STEM activities. 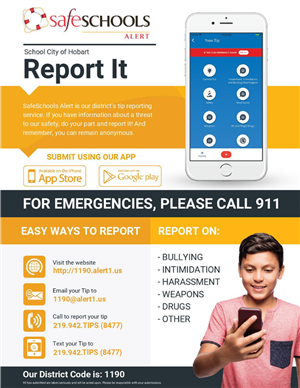 Use the anonymous tipline to report bullying, intimidation, harassment, weapons, drugs, dating violence and more in 4 easy ways. Call or text to 219-942-TIPS, email to 1190@alert1.us, or visit our site at http://1190.alert1.us. All tips are anonymous! sexual orientation, marital status, genetic information, or disability, including limited English proficiency.